This will read aloud text using a voice installed on your computer. If you wish to see the text being read aloud turn this option on in the settings, to display the reading window. To hear text read aloud first copy it to the clipboard. First select the text then copy it by using a shortcut key, usually Ctrl+C, or through the context menu by right-clicking. Then select the speak button. You should hear your coped text read aloud. As text is being read, the speak button changes to a pause button. Select the pause button to stop the speech. Selecting the button again will re-start the speech from the same point in your copied text. Once you have listened to your text, you can empty the clipboard by selecting the Clear button. If you need to hear maths equations read aloud, you need to use software that can interpret the symbols and equations into speech. You can use ATbar with STEMReader, an application for reading aloud maths equations which has a free, basic version. Copy equations in MathML or LaTeX to the clipboard and then click the Maths button in ATbar. If you have STEMReader installed, you will see and hear your equation. To find out more about making accessible maths equations that are compatible with assistive tools please read the Accessible Maths article from STEMReader. This will apply a colour overlay effect to you monitor. You can set the colour and level of transparency within the Settings. There are four tabs within the settings. Click the save button to apply your new settings. Check this box to enable you to see the text in the reading window when it is being read aloud. 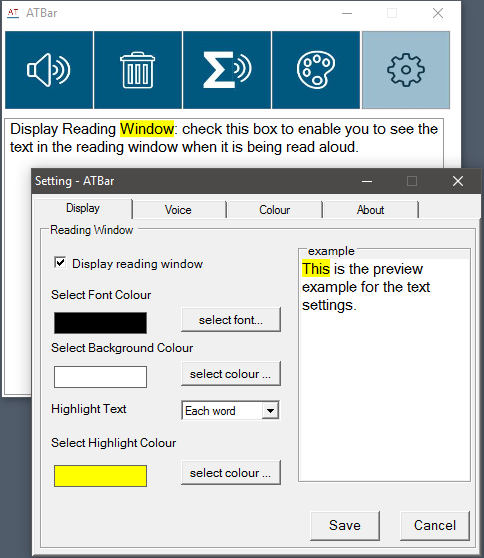 Choose the colour for the text in the reading window. Choose the colour for the background of the reading window. None – for no highlighting. Each word – for individual words to be highlighted. Each sentence – for the whole sentence to be highlighted as it is read. This drop-down menu lists the voices installed on your computer. Select the one you wish to use. This allows you to speed up or slow down your selected voice. This will read aloud the example sentence with your new voice settings. This tab allows you to personalise the colour overlay tool. Check the box labelled “Apply colour overlay on launch” if you wish the overlay tool to be apply automatically when ATbar is started. To change the colour of the overlay use the “Select Overlay Colour” button. You can add new custom colours by selecting “Define Customer Colours >>”. Use the slider to alter the transparency of the colour overlay. A lower transparency will lead to a more intense colour overlay effect.